Sigh, this is the kind of forecast that gives me a headache. Every spring and every fall — the transition seasons — I "bust" at least one forecast by at least 15 degrees. Tuesday is admittedly one of those days, with models all over the place and the forecast "margin-of-error" pretty much encompassing the entire state. As cooler air invades from the northeast, it's really a crapshoot to pinpoint who ends up on the warm side and the cool side of the line. This is a "backdoor" cold front, so named because it comes from the opposite direction (northeast) as usual (west). Typical of springtime, it spells unseasonably cool temperatures for North Jersey and the Jersey Shore. 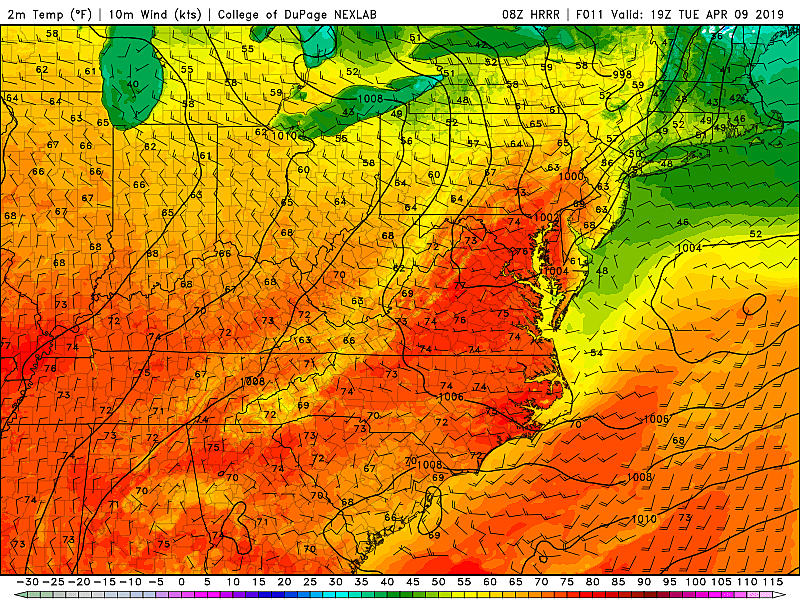 So, let's take a stab in the dark at some high temperatures for Tuesday, which will probably range from the lower 50s (north and coast) to lower 70s (inland south). Newark: 59. Trenton: 68. Belmar: 56. Camden: 76. Atlantic City: 66. Give or take. How to dress today? Layers. You may flip-flop between cool and warm as the day goes along. Not quite summerlike, not quite winter like. We'll see partly to mostly cloudy skies throughout the day, with a light breeze. By Tuesday afternoon, our attention will turn from the effects of the backdoor cold front to a 'normal' cold front approaching from the northwest. 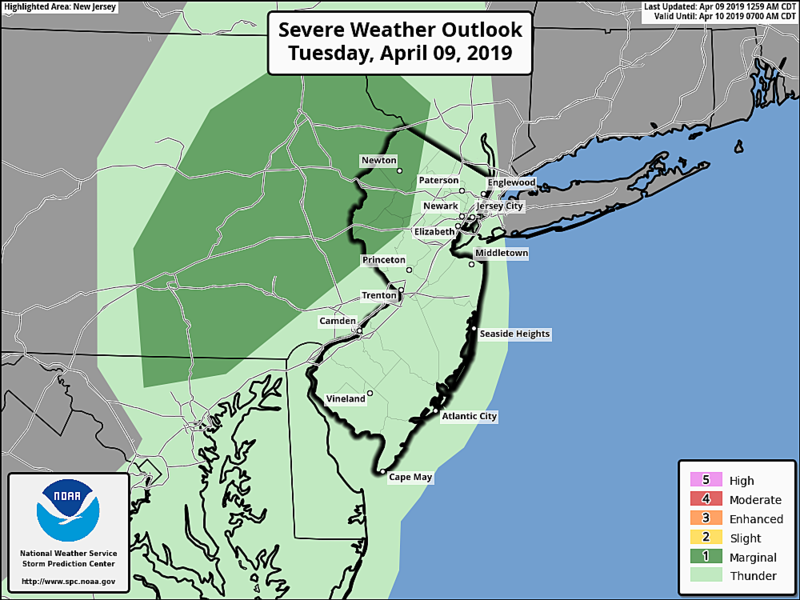 That front is expected to spark a line of showers and thunderstorms from about Tuesday mid-afternoon through Tuesday early evening (3 p.m. to 7 p.m.) Rain will be brief, but could be heavy in spots. And some of those storm cells could be on the strong side, with gusty winds and frequent lightning. 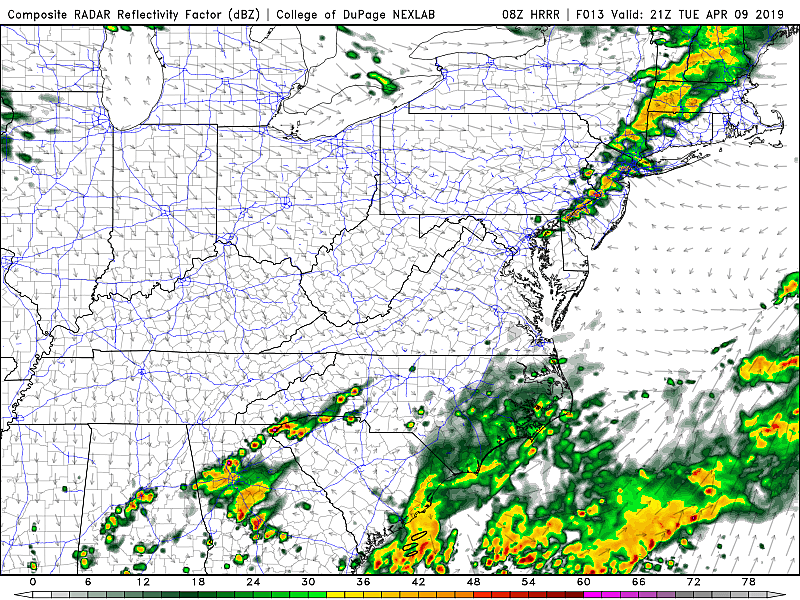 The best chance for stronger storms will be along the warmer western edge of NJ. Storms should "fizzle" to showers as they approach cooler coastal areas. Unfortunately, these storms may impact your evening commute. For Tuesday night, the entire state will clear out and cool down. Thermometers will end up in the lower to mid 40s by Wednesday morning. Wednesday doesn't look too bad, as we'll enjoy mostly sunny skies and seasonably cool high temperatures in the upper 50s. You'll feel a stiff northwesterly breeze, up to about 20 mph, throughout the day. Another decent barely-below-normal day is forecast for Thursday. It will be partly sunny, with highs again in the upper 50s. Clouds increase on Friday, and so do temperatures. Highs will spike into the 60s across most of the state, with a stiff southerly breeze. Our next storm system is scheduled to arrive Friday evening, with a batch of rain and spring thunderstorms sweeping through the state. Again, not extended and not overly dramatic. It looks like we'll dry out and warm up for the start of the weekend. Fueled by a brisk southwesterly wind, highs on Saturday should return to the 70s. With mostly to partly sunny skies, it looks like the first half of the second weekend of April will be another winner. Sunday, however, goes downhill. We'll hopefully still see temps generally in the 60s. But a sizable storm system is forecast to arrive Sunday afternoon, leading to a soggy period of weather through Sunday night and much of Monday too.